One of the most flamboyant early aviation pioneers was Texan Samuel F.Cody. Former cowboy and wild west show operator, Cody settled in England in 1890. 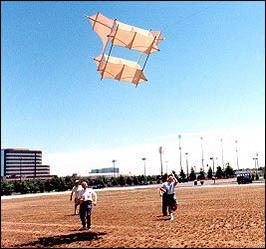 In 1900 he became interested in aeronautics and he soon developed a large winged boxkite which was used for man-lifting experiments. 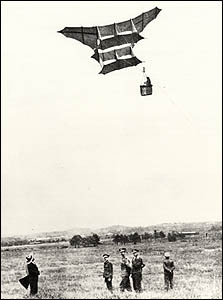 The British War Office carried out extensive trials in 1904 and they adopted the system for aerial observation in 1906. Using his knowledge gained from kites, Cody's courage and enthusiasm further led him to experiment with powered flight and in 1908 he became the first man to build and fly an airplane in Britain. Josh Stoff, our curator felt that to be really complete, our collection should contain one of the more unusual kite designs of the very early 1900s. This is the Cody man-carrying kite designed by Texan, Samuel Cody, who had worked on a horse ranch, and at the age of 19, was sent to accompany 50 horses that had been sold to a buyer in England. He learned the art of kite-building from a Chinese ranch hand and, while in England, tried to convince the British Navy that they would have the advantage over an enemy if they could get an observer high enough to serve as a look-out. Cody’s kite, in a strong enough wind, could lift a man in a sling under the kite flown off the back end of a moving ship. His design was successful and it did work but the Navy turned the idea down. 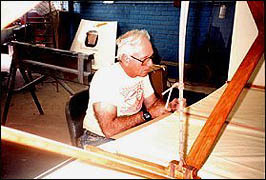 Several years later, Cody made the first powered flight in England. Because the kite is essentially fabric and supporting poles, Josh needed someone who could choose a fabric, and cut and sew the many dozens of intricate shapes needed to make a Cody kite. 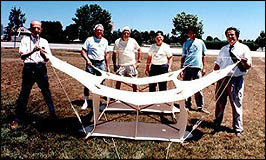 In January of 1999, he asked me to join three other men, Sy Goldberg, Hank Iken, and Sal Mazzara, who had already entered the planning stage of this kite. 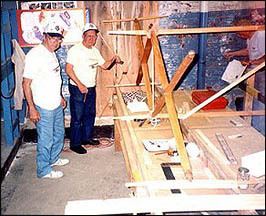 We became a four-man team and while I did the fabric work the others bought poles called Calcutta, a bamboo-like pole, but with smaller knuckles, that we were told would be less subject to splitting. The cutting, notching and exact shaping of these poles was essential or the sewn fabric would not assume the correct shape in flight. It flew, but when the pullers stopped running, it came down harder than it should have and broke two sticks. Two weeks later it was repaired and adjusted and ready for another flight. This time it flew …not a great flight, but a flight, nevertheless, with a soft landing. The work was tedious and exacting but six months after we started we were ready for our first flight. On a day in July, with not nearly enough wind to lift a 17 lb kite, we four men, whose combined ages totaled approximately 280 years, ran with this kite while our young curator and his assistant pulled the other end of a 100 foot long line.